Hyacinthus was a beautiful boy from Amyclae (near Sparta) who was loved by the god Apollo. According to the usual story, Apollo killed him accidentally with a discus throw – misdirected, deflected, or diverted by a jealous rival (Zephyrus, the west wind); this was the foundation myth of the important Spartan festival of the Hyacinthia. The tale is most fully told by Ovid (Metamorphoses 10.162-219), who (naturally) has Hyacinthus metamorphosed into (naturally) a hyacinth. But in the comedy The Cities (Poleis), by Aristophanes’ contemporary Eupolis, someone thinks this death inappropriate: “Hyacinthus,” he says, “ought to have been killed by an almond” (Eupolis, fragment 230). Who said this, and why, we do not know. 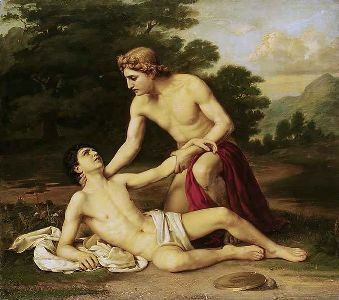 Possibly his point was that if Hyacinthus had not died at Apollo’s hand, there would have been no Hyacinthia festival – one occasion less, then, for Spartans to celebrate; The Cities is generally believed to have been produced in or about 422 BC, when Athens had been at war with Sparta and her allies for nine years. Perhaps it was the same character who made some very double-edged remarks (fragment 221) about the long-dead politician and general Cimon, Sparta’s greatest friend at Athens: “He wasn’t a bad fellow – bit happy-go-lucky, and liked his drink; sometimes he’d not come home at night – he was in Sparta, leaving Elpinice all alone here” (no, Elpinice wasn’t his wife; she was his sister). Why an almond, though? Everywhere else in Greek comedy, almonds are a sweet item that one nibbles at, usually at the end of a meal. That’s the cultivated almond. But wild almonds, which are bitter, contain cyanide, and it doesn’t take all that many of them to be lethal – although a doctor in the service of Drusus, son of the emperor Tiberius, used to eat five or six of them before a drinking bout to enable him to drink deeper and longer (Plutarch, Symposiac Questions 624c-f; “the experiment is not recommended”, comments Andrew Dalby in Siren Feasts, London 1996, page 232 note 132), and small quantities of bitter almond extract appear fairly frequently as ingredients in medical prescriptions. The Eupolis passage shows that it was well known that bitter almonds could be poisonous. One can easily imagine a child who was fond of almonds taking a whole mouthful of the wrong kind by mistake, with catastrophic results. And perhaps our man in Eupolis was saying that he wished Hyacinthus had died in that agonizing way – because he was a Spartan.